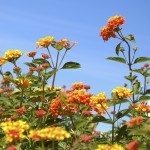 I planted a lantana over 2 months ago. Initially, it was blooming but it has not bloomed since then. It seems healthy and is growing but no blooms. I have it in a hanging planter. Any advice? You might want to add some phosphorus to the soil to help with blooming. Bone meal is a good source for this, or use a fertilizer that has a higher phosphorus ratio.